UPDATE: Spirit Airlines says that issues affecting its service across the country are not the result of a strike. 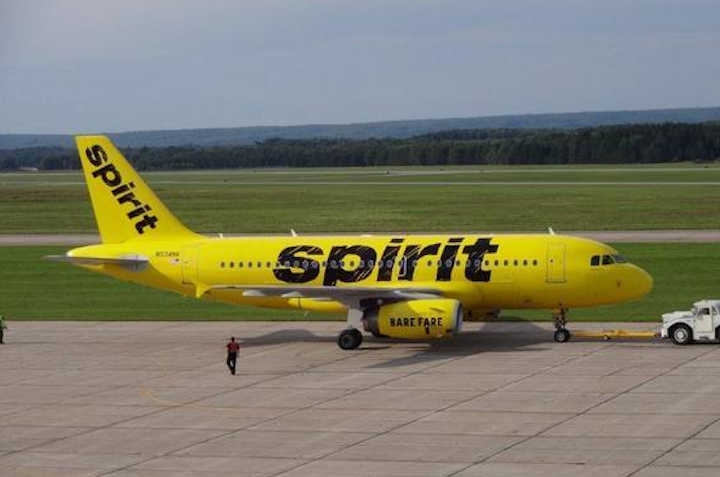 Travelers around the country with tickets for Spirit Airlines flights are reportedly dealing with a lot of delays and cancellations right now. And many passengers say those hiccups aren’t only due to bad weather, but a possible pilot strike. Several passengers have contacted Consumerist sharing their story of being stranded at airports, sometimes for several days this week, after the airline canceled or repeatedly delayed their flights. When reached for comment, a spokesperson for Spirit blamed the travel issues on weather. She did not provide comment on the possibility of a strike. While it’s true that certain areas of the U.S. are being drenched by Tropical Storm Bill, many stranded travelers say the bad weather is nowhere to be found at their location. @consumerist Spirit Airlines has cancelled all flights out of Myrtle Beach to LGA for two days blaming non-existent bad weather. Any scoop? Weather over the past few days show little to no precipitation in either Myrtle Beach or New York, according to Weather Underground. Of course, that doesn’t account for any adverse weather in between the two locations, or for changes in crew/aircraft that could be affected by delays and cancellations in other cities. Several Spirit passengers posted on Twitter that their flights had been delayed because of no-show pilots and crew members, leading to further speculation of an unofficial strike. Sitting at MCO #SpiritAirlines "waiting for the pilot" and crew to show up. On strike? Additionally, WKYC-TV reported today that passengers at Cleveland Hopkins Airport have waited nearly two days to leave the area and been given several reasons for the disruption from Spirit employees, including a strike. Customers initially slated to travel from the airport to Atlanta on Tuesday were told their flight was canceled due to weather. When they returned the following morning they were reportedly told the trip was delayed because of a pilot strike. The flight was eventually canceled and passengers rebooked with other airlines. Stranded customers who turned to social media to express their displeasure to Spirit over the continuous delays received little recognition. As one might expect the automated responses haven’t been welcomed with open arms by passengers affected by recent delays and cancellations. @SpiritAirlines except for your customer service crew. They don't work well. EVER. For anyone. Especially the customers. While many of the passengers affected by the weather delays – and possible strike – are still waiting to make it to their destination, others say they’ve been rebooked with other airlines. #Spiritairlines Paying a second, real airline to get me home tonight. My bad for trying you. First, last time. #spiritairlinesmustdie"
Consumerist has once again reached out to Spirit regarding its social media responses and clarity on whether or not a pilot strike is taking place, and we’ll keep you posted on any updates.